45th Annual Sacred Heart Holiday Home Tour is Back! Celebrating its 45th Anniversary, one of Northern California’s most loved holiday home tours returns this year with five elegantly decorated homes in East Sacramento’s historic Fabulous Forties neighborhood. The Holiday Home Tour is a fundraiser that benefits Sacred Heart Parish School, and is organized by the parents of Sacred Heart Parish School. This event occurs rain or shine. All ticket purchases are non-refundable. Friday, November 30th, 12 p.m. to 8 p.m.
Saturday, December 1st, 10 a.m. to 7 p.m.
Sunday, December 2nd, 11 a.m. to 5 p.m. The 62nd annual Singing Christmas Tree is set to debut the first week of December. This year’s show, called The Song of Christmas, will be an unforgettable celebration featuring iconic Christmas music and dazzling entertainment. 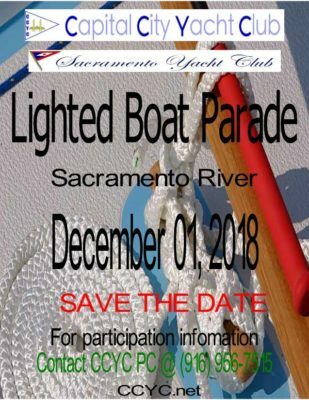 The Old Sacramento Waterfront is offering another way to light up the holidays… Mark your calendar for the fun, festive and FREE Lighted Boat Parade Saturday. Best places to watch the parade are Tower Bridge (California) , Old Sacramento Public Docks , The Virgin Sturgeon, The Delta King and Crawdads On The River. First pass of Old Sacramento will be between 5:30pm and 6pm with the return pass around 7pm.